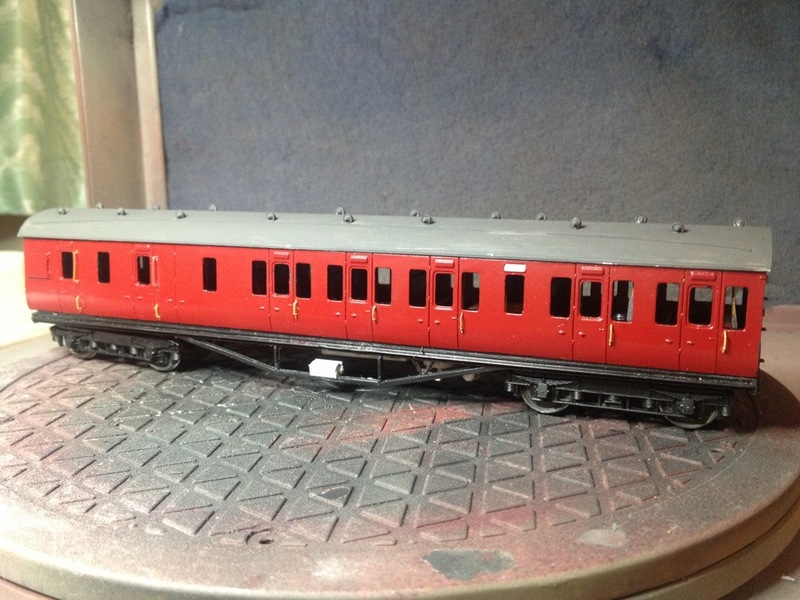 Feeling a bit more motivated to sit in the workshops now things have cooled down a little in the north, I was keen to make a little more progress with the 1790 so on Friday night, I got the airbrush out and gave the model a good coating of Railmatch BR crimson. This is actually a rather lovely, vibrant colour and it’s a shame BR chose to replace it with a rather sombre shade of maroon after 1956. It has actually gone on with a rather nice sheen that shouldn’t require too much glossing up before the application of decals. 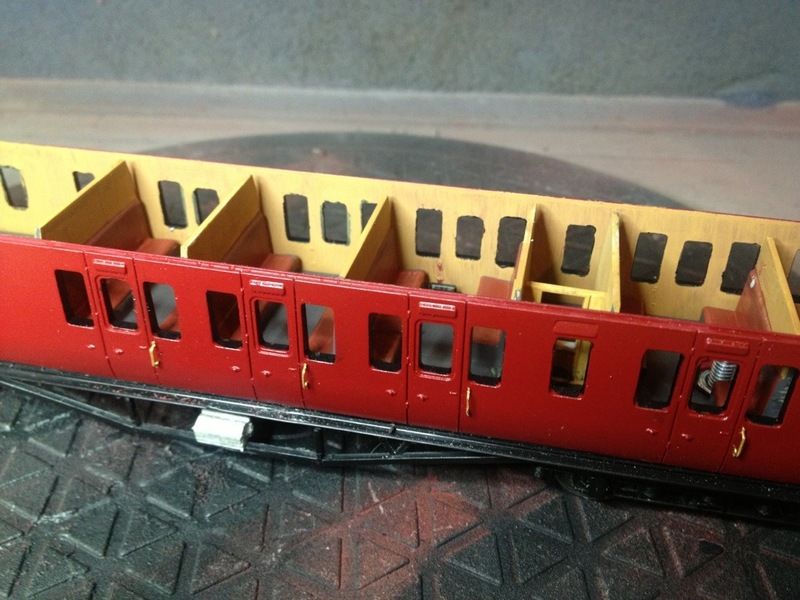 I also ran a paint marker on the inside of the window frames – this makes a big difference to the appearance and will enhance the look of glazing when it’s fitted. I’ll allow it to settle and cure a day or two before I visit that and meantime I have busied myself painting up the interior. I’ve no idea if these colours are truly authentic but I actually used Lifecolor brake dust (acrylic) for the interior cream as I’m pretty sure that the interior finish would have discoloured to the kind of dirty yellow seen here pretty quickly not only on account of the environment of the steam railway but also due to the universality of the smoking habit in the 1950s! The interior finish isn’t at all sophisticated but it should suffice given the limited interior visibility. I also took the opportunity to fit Frogmore grab rails to the doors. What I wasn’t prepared for was the sheer ease with which they went into place. 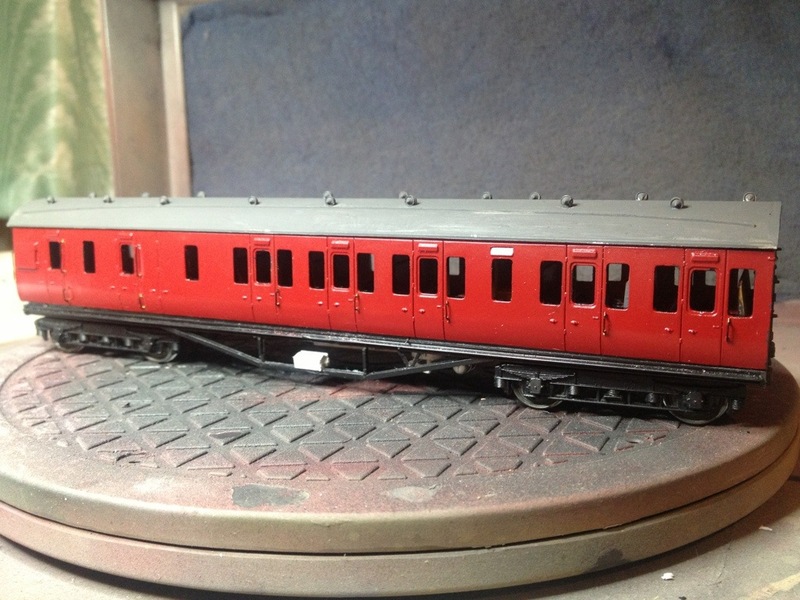 One thing I would suggest to Frogmore though is that they could maybe produce some 8 and 9mm versions as I still had to make the extended guards’ door handrails myself; a task which you probably understand by now ain’t a personal favourite! A cursory lick of paint on the rails finished the evening’s work. I’m pleased with the look of the model so far and this project really seems to be bringing out the best in what’s now a vintage model. I did not realise that these coaches were used on the Waverly, very nice. Not entirely unusual after 1948 Tim, particularly on the Langholm and Hawick trains. This one has dual use potential though as I’m more likely to commence a small project modelled on south west Scotland before embarking on any big Waverley-style ventures. This one EM bud or P4? It’s EM, Mac. Perfect bit of all-round stock for any project.